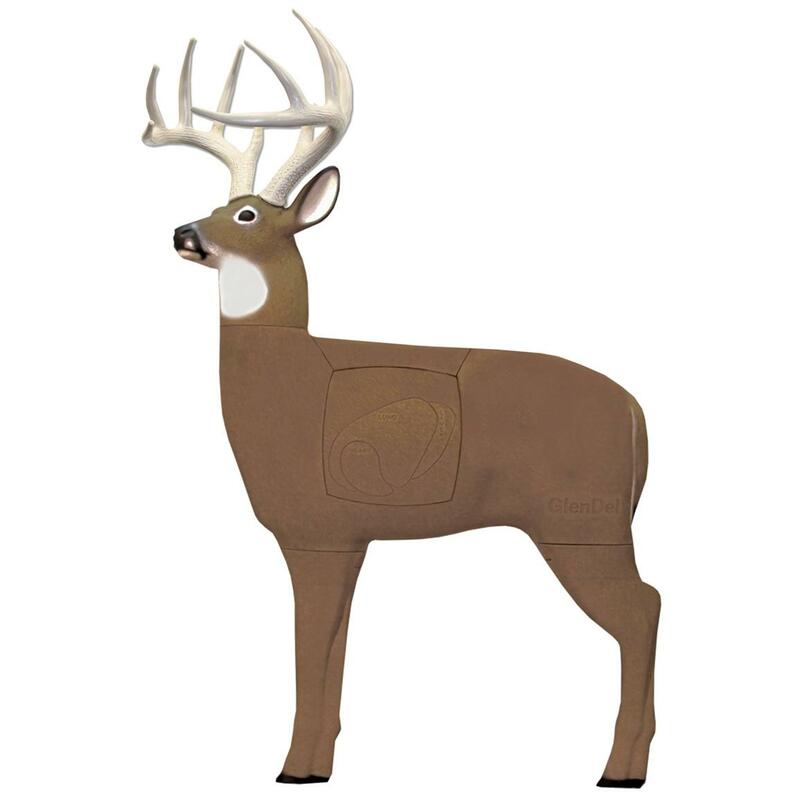 GlenDel® Pre Rut Whitetail Deer Target gets you sharp for season. SAVE BIG! With a super-sized, four-sided insert much larger than other 3D targets, you get a great view of vitals to hone your aim! GlenDel® does it right... with PolyFusion technology, the Target takes any team, including fixed or mechanical broadheads. Stands 36" tall at the shoulders, built to the specs of a 250-lb. deer. Antlers measure a total of 150" long. Lasts twice as long as the competition, plus EASY arrow removal! These came off the line with slight cosmetic blemishes. No worries... performance is guaranteed, and you save BIG! Order Now! GlenDel Pre Rut Whitetail Deer Target, Slight Blemish is rated 4.7 out of 5 by 7. Rated 5 out of 5 by PA Bowhunter from Works for me For being a "factory blemished" target, the defects that I have on my specific target are very minimal. There are very minor pours or some coloring missing here or there, no biggy at all. The shooting surface is 100%. That's all that really matters to me, after all, that's why we buy targets, to shoot them. Great buy in my book. $80 off for a target that performs equally well as any other new one. Shipping was fast as usual. Rated 4 out of 5 by BBOWS from Great price The target area itself and looks of the deer are great. I'm concerned about the hard plastic legs. I give shooting lessons at my bow business and I'm concerned how long it will take to chop down the legs with stray arrows from beginners. Arrows pull easy on all parts of the body, not the legs. I know the body is what they are aiming for but how many leg shots have you made? Rated 4 out of 5 by Rob10 from This is a great product for the price. Pleased with this target, does just what it was intended for. Rated 5 out of 5 by John from Great Fathers Day Gift! Bought this with my siblings for my dad, well let's just say he is hooked! He is shooting his custom longbow every day. The target is holding up well. Buy it. Rated 5 out of 5 by Bobbie from excellent target only a small blemish on nose and then on belly. Does not detract from target value. The heads-up sight designed especially for crossbows.